The "Sawbo Banger" has arrived...again! We tried these last a couple of years since, so the time was right that we revisited, our review! 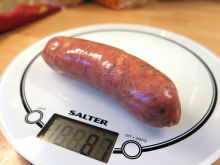 Now looking to avoid controversy of course but do we still have to use the word "sawbo" to describe this sausage as there are many things made of Sorbo, which is a type of rubber! We know from our previous sampling, that these good looking beauties are definitely not at all "rubbery"! 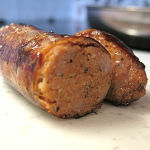 Jason Drage of the Churchgate Sausage Company produces some wonderful sausages and since he created and introduced this recipe in 2013, by all accounts, it remains popular and still sells well. 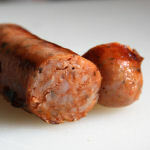 70% outdoor reared Essex pork shoulder, combined with a good helping of locally produced tomatoes, tomato puree (10%), breadcrumbs, salt, spices and some basil, all put in to good quality cases really do produce a very good tasting sausage! Sweet(ish) but not too sweet, meaty and definitely one to try! Still good value too. Yes OK the price has increased slightly over time, but come on, it still remains very good value we'd say for a premium product. The skins cook up and brown really well. The texture now is slightly finer we'd say, but is still on the courser side, and the pork retains quite a succulence and good colour. The taste is as good as the bite and chew. We commented last time that the basil and spices were not as defined as we would have expected, but we'll take that back this time. The flavourings are well balanced and yes the slight sweetness of the tomatoes is still there but a very good flavour is achieved. 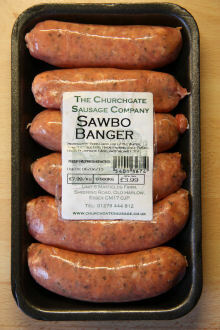 These bangers are yet again a good, well made sausage which we've come to expect from Jason Drage of the Churchgate Sausage Company. I liked these a lot, yet again. Now hear this...you don't have to live in Sawbridgeworth to try these you know! 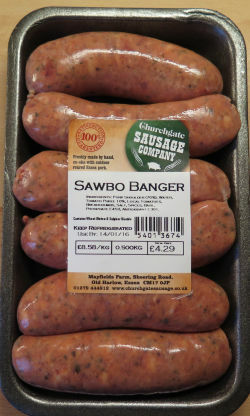 Look out for the new style labelling and try the SAWBO BANGER yourselves, you will not be disappointed. 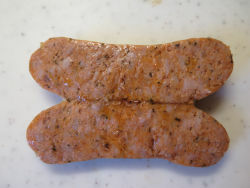 120x30mm before cooking, 110x31mm after. That's a shrinkage of approx 5% & weight loss of approx 4%.